The Ryedale Rally is go again for 2019!! The Organisers have been out recently scouting out new routes for this years rally. Hopefully we can gain some new going if the Forestry and National Parks people play ball. The regs will be out shortly and entries will go online on the Calendar page on this site on Tuesday the 26th February at 8.00 PM. The event will run on the 6th and 7th of July 2019. The event will once again use the new start area in East Ayton which is only a few miles from Scarborough thus increasing the accommodation possibilities for the riders. It will be an enjoyable 250 miles (over 2 days), of forest tracks, moorland trails, tricky twisty bits in the woods and quiet country roads through beautiful countryside. There will be free food on Saturday night and a pub just down the road. We're working hard for a great weekend so come and join us in July. ie if there are 5 riders wanting to ride together 3 riders would for instance put Team Dipstick 1 and the other 2 would enter Team Dipstick 2, the last two riders results wouldn't count towards the team awards as each team must have 3 riders, but they would get to ride with the other 3. In other words I need an electronic record of who wants to ride with who. The North Riding Enduro Club hosts the White Horse Enduro, part of the Northern Enduro Championship held at Boltby forest on 30th September. After last years awful weather, the team have been working overtime to make sure that the event this year doesn’t disappoint. The team have been working hard to ensure they host another cracking Enduro. Last year was tough going due to the unexpected downfall of rain the night before, however with the recent glorious weather, the forest is looking dry and prime ready for action on 30th September! Last year, we moved to a new start area up at High Paradise Farm at the top of the forest and we are pleased to announce that we are returning this year! We would like to extend our thanks for allowing us use of the field for the start. Camping will be available on the Saturday night with a charge payable to the land owner. Why not make a full weekend of fun?! With some new going and tracks that haven’t been used for a few years, alongside some of the usual trails, this event is shaping up to be another fantastic race. The technical going will be an enjoyable challenge with a new special test for this year. As always this is a traditional Time Card Enduro with challenging terrain and technical going. It will be suited for all ability riders but will certainly be an enjoyable challenge. The special test will be located in a different area from last year's test. We would like to thank the riders for their feedback and reviews from last years event. Hopefully the weather holds out for us but nevertheless we hope that it is another brilliant event. This event is no doubt bound to sell out fast.. the entry is limited due to the size of the forest, once it is full, its full! so make sure you do not miss out and get your entry in early to guarantee your place!! There will be no day entries available once full. To enter go to the calendar page. 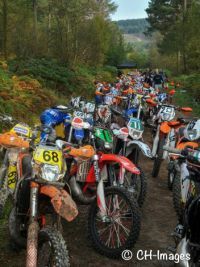 The North Riding Enduro Club hosts the White Horse Enduro, round 6 of the Northern Enduro Championship held at boltby forest on 1st October. After last year's successful knockout event, the team have been working hard to ensure they host another cracking enduro. With the introduction of a new start venue it will allow for easier parking and camping, new to this year's event. As always this is a traditional time card enduro with challenging terrain and technical going. It will be suited for all ability riders but will certainly be an enjoyable challenge. The special test will be located in a different area from last year's test. Get your entries in for this top event. For more info go to Southern MCC website. At signing on for each event you will be given a time card. Usually sealed in a plastic wallet it will have a space for your name, riding number and start time. Firstly write down on the card your riding number and start time taken from the entry list. Then add the times you are due at each check by adding on the time allowance for each check (in your class) on to your start time as below. The jpeg at the side of this text is a timecardcard at the end of the event with the ETA times, that the rider is aiming to achieve and the official times, ie the time he actually arrived. (A) On time - zeroed the check. (C) The rider has added 5 minutes on to his arrival time at check 3 (you do not need to actually change your card the organisers will take the 5 minute lateness into account when working out the results) so he has still taken the allotted 40 minutes to do check 3….no penalty. (D)The rider is continuing to add his five minute lateness to his check 4 time, he has taken 40 minutes from check 3 to check 4 and has zeroed the check….no penalty. Once you are late, you stay late. If you arrive early you do not check in until your set time, you will be penalised for early arrival. Don’t panic if you loose time, others will have too! The guy who has the least points in total wins! !